It doesn’t seem nearly seven months since Dorothy phoned and asked “I don’t suppose you would consider being our new Secretary”? Cathie Walkinshaw had retired in March after four years as Secretary, thank you Cathie for all your hard work, we wish you and Danny a long and happy retirement. Perth in February was judged by Robert McNee and a record price of 22,000gns was achieved for Omorga Samson. An overall record average of £4486 for 114 sold, and nine bulls at five figures. 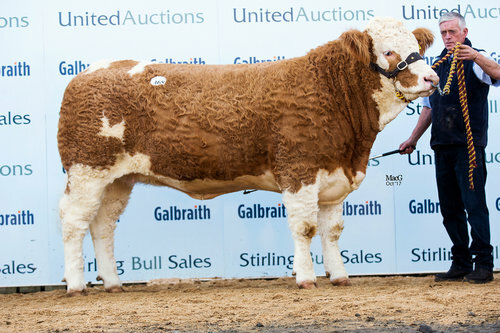 Top prices by Scottish Members were 15,000gns for Andy Wilson’s Cairnview Snazzy, 11,000gns for Finlay McGowan’s Dirnanean Snowi and two bulls at 10,000gns; Halenook Supercharger from Alan Rawcliffe and June Telford and Glenturk Supreme from Brian Allan. Tillymaud led the female sale with their champion Tillymaud Malvenas selling for 4200gns and John Young’s draft of seven heifers averaged £2850. On a sad note in April we lost two of the Breeds greatest enthusiasts George Clark, stockman at Milnafua & latterly Corskie and David Argo, founder of the Tillymaud herd. At the end of April we held our Junior Stockjudging training day at Drumsleed by kind permission of Gerald and Morag Smith to select our teams for the Royal Show. The Judge was Robert MacGregor and Trainer was Neil McGowan. Those selected to go forward and represent the Club as the Senior Team were Caroline & Gillian Greenhill, William Young, John Paterson and our Junior Team was Ross King & Nikki Hughes. Well done to Caroline who was 3rd individual over 21, and with her sister Gillian they were 1st Senior team, and joint 1st for reason giving. Thank you to Pfizer who very kindly agreed to sponsor the Young Members. Simmentals also sold well in May at the Multi-breed sale at Perth, taking nine of the leading prices. Simmentals topped the averages and the highest number of bulls sold (25 average £2881.20). The Starline herd sold the two top price bulls both at 4200gns, leading the Scottish breeders were Robert and Paula McAlister with two at 4000gns-Bruchag Scottie and Saturn and at the same price Stuart and Hazel Stronach with Islavale Shamrock. Our Annual Commercial sale of Simmental cross females, sponsored by Merial was held on May 4th with Mr. Harold Murray, Turriff , Aberdeenshire Judging and placing 1st the pen of 4 bulling heifers from Hector Macaskill, Woodhall. 1st placed Simmental x heifer with calf at foot went to Mr. Baxter, East Skeichan, Arbroath. On 31st May we were at Beef-Tech in Aberdeenshire, (see report in Review). An excellent day with a great display of cattle from Delfur, cow & calf, two pens of bulling heifers from Corskie & Berryleys and beef bulls from Connachie. The heifers were later auctioned by Alex Fleming and made £1000 & £820. Congratulations to Committee Member, Caroline Greenhill who got married in June to Clark Farquharson, good luck to you both. Next it was the Highland Show, the Marquee being a great success in its new position at the end of the line, straight opposite the Judging Ring. There was an excellent show of cattle for our Judge, Mr. Rob Smith, who selected Drumsleed Susannah a two year old heifer as his overall Champion from Gerald & Morag Smith and his 3 Regions 54-75:2 Regions 28-54 16/1/08 08:35 Page 69 Hector Macskill (Woodhall) being presented with his prize for best pen 4 bulling heifers, by Mr. Kevin Douglas from sponsors Merial. Reserve Champion was Skerrington Rebecca 18th, a 5 year old cow from John & William Young. I would like to thank Kirsty Thomson & Lucy Harris who helped on the Stand serving refreshments, and to the Scottish Club Members who helped set up the Stand and man it all through the Show. Saturday evening was the Clubs annual barbeque at the Highland showground which was organised by Dorothy, and enjoyed by all who attended. Winner of the “Corskie Trophy” for the Young Stockperson of the year at the Royal Highland Show 2007 was Neil McGeoch, Hazelden. Well done. During the summer the points Competitions was held, but due to heavy rain and the Foot and Mouth outbreak in Surrey the later Shows in the North especially, were affected. The competitions were once again sponsored by WCF Country Centres, McCaskies and Carrs Billington. The winner of the Central Competition was Gerald and Morag Smith, Drumsleed with 100points and Reserve were Caroline and Gillian Greenhill with 72 points. Winner of the West Competition was Lachlan Quarm, Annick with 76 points, and Reserve was John Young, Skerrington with 40 points. The Northern Competition was won by WJ & J Green, Corskie with 92points and Reserve Rob Smith, Tillymaud with 34 points. Many herds entered again this year and prizes were awarded at the Clubs AGM, when we also presented three sets of John Collins glasses, to the Champions of the following Shows; Drymen-T & E Henderson (Desswood), Braco - C & G Greenhill (Craighill) and Black Isle- WJ &J Green (Corskie). Thank you to all that entered the Summer Shows. After being postponed due to Foot and Mouth the October 2007 Perth Bull Sales eventually took place on 12- 15th November, judged by Mr. Brian Grant, Dellfield, Inverness. Despite being postponed, the sale was hit again, this time by Blue Tongue. The entry was reduced due to most of England being under the Surveillance zone and as a result about 40 Bulls were unable to be present. Average price was £4134.90 up £190 on last October, for 75 sold out of 121 forward, but with fewer bulls changing hands (98 in 2006). Overall Champion was Andrew Hanna's Stralongford Trojan, which sold to the Judge for 16000gn's. Top price was the Reserve Champion also from Northern Ireland, Robin Boyd’s, Slievenagh Talisman which sold for 20000gn's. Two other Bulls made five figure sums -Kilbride Farm Tweed at 13000gn's going to John and William Young -Skerrington, and Popes Tonka at 12000gn's. Top Scottish price was Douglas Smith's bull Boswell Tornado at 8000gn’s; Douglas was also presented with the Young Handlers Shield for best Young Stockman at the Autumn Sale. Females sold to 6000gn for Crugmelyn Twilight, selling to James Goldie and Patricia Ross, Dumfries. 80 females averaged £1707.17. Congratulations to Robert MacGregor who was elected to Council. Thank you to John Dykes who had completed his term of office, having been former President of the Society, we congratulate John on his appointment as President Elect of the Royal Highland Society. At the Scottish Clubs AGM Caroline Greenhill, Tom Henderson & William Young retired from the Committee, thank you to you all for your hard work for the Club. Morag Smith, Neil McGowan and Neil McGeoch were elected onto the Committee. Finally I would like to thank all the Committee for their hard work over the past year especially our Chairman, Dorothy Moffat, and to all at the Simmental Office for their help and support.